First day at EPCOT. The kids were super excited and dragged us all over the park. Second day, Animal Kingdom. My own Jurassic Park moment, though with less running and screaming. I believe in ghosts. I'll admit it. I believe some (but not all) stories have something behind them, something which we don't understand. I've heard a lot of different theories, like personalities being caught in some kind of electrostatic ether after death, like some kind of spiritual cloud download. I've heard theories that hauntings are actually some kind of perceived time slip, allowing us visions of the past or future. Similarly, there's the theory that we're glimpsing alternate dimensions or timestreams. I've got my own theories, although they're probably not original. I believe there are three types of hauntings. First and most common are residual hauntings. I think of them like recordings, bits of the past which somehow end up imprinted on a building or piece of land. These are the ones where people see a lady in white or a Victorian gentleman walking down the stairs or across the garden. One thing I've noticed in the ghost stories I've read or heard about is that you rarely see hauntings of this type where the "ghost" is from before the 1800s. This brings me to the second part of my theory, that these recordings eventually get worn out or overwritten. Sooner or later, a residual haunting will fade. The second type of hauntings are where the ghost is able to interact with people. Stuff gets moved around, voices respond to questions or comment on what is happening or the spectre or apparition reacts and communicates with people in the present. I believe these are the result of people getting trapped in this world after death. These spirits seem to be desperate to communicate with us, which makes me think being a ghost is not a great experience. The third type of haunting are spirits which don't seem human. Maybe there are other types of non-corporeal entities or maybe they're older human spirits which have gone insane after years or decades of being trapped between worlds. Both options are interesting to me and ones I'm looking forward to exploring. I don't assume that all ghosts are malevolent or out to scare people. One of the most touching stories I ever heard was of a family who used their ghost almost like a babysitter. They would hear their young children laughing to themselves and when they got older, they said they were laughing at a man who used to come and make funny faces at them. The mother was convinced it was her father, who had passed away some years earlier but had always looked forward to having grandkids and was great with young children. She believed he'd come back to or hung around so that he could spend time with his grandchildren. She said it made her feel better to know he was keeping an otherworldly eye on her family. I think we're arrogant to believe we have all the answers. People have believed in life after death and ghosts across all cultures and throughout all of recorded history. I refuse to believe it's all part of a comforting delusion. Not great but a productive week on many other fronts. I sent in proposals for two workshops to Can-Con, a speculative fiction conference over the Halloween weekend here in Ottawa. I'd already booked a table for the weekend but I like the idea of giving a workshop as well. My first proposal was for how to craft a romantic subplot for different genres (sci-fi, fantasy, horror, etc) and my second was on indie publishing and the business of being a writer. 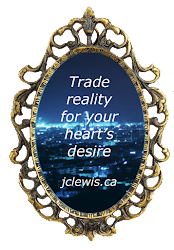 I'm also putting together a workshop for ORWA (Ottawa Romance Writers' Association) for their January meeting. That will be on the different non-verbal ways we express what we're thinking and feeling. I've got that one almost done, except for the Powerpoint presentation. This week I also booked a cover reveal blitz. I'll be revealing the cover to Metamorphosis on Monday, October 19th. If anyone is interested in signing up, they can talk to Xpresso Book Tours. I'll recuse myself right now: I love stories. There's almost no format I don't enjoy exploring a story with: books, short stories, movies, TV shows, comics, plays, dance, I like it all. This is why it irritates the heck out of me when I hear something dismissed as "just a story" as if it could never be significant or important. To me, the story is always what makes it interesting and significant. Statistics can give you a good overview and a general idea, but it is the individual stories which touch our hearts. I can read all the scholarly articles about the failures of low-income area schools and the importance of using athletics to help kids escape those areas, but it won't have the impact of reading or watching The Blind Side and connecting with Michael Oher's individual story. Without the ability to play football, he would have been trapped in a cycle of poverty and hopelessness. I've read the book and watched the movie and it gave me a little glimpse of what it is like to be discriminated against and to be entirely dependent on a single set of skills to succeed in life. I don't pretend I understand all of the nuances, but the story opened a small window allowing me a greater level of understanding than I had before. That is what stories can do and when they're done well, they can change everything about how you see and understand the world. The story doesn't even have to be true. Some of the greatest opportunities to explore different issues are explored through fiction. I'm partial to science fiction and fantasy myself, which has a reputation for tackling social challenges under the guise of aliens and monsters. I've heard veterans talk about Lord of the Rings as representative of what it's like to go into combat with friends. They connect with Frodo and Samwise as they struggle in the middle of a larger conflict. They can identify with their struggle to work with Gollum, whom they don't trust but still need, a situation which can frequently happen in the life and death arena of active service. Exploring different stories gives me the opportunity to move beyond my own limited experience. It's like living thousands of different lives. I can be a man, a woman, a child, different races, and different species. I can fight in wars, build homes, solve crimes, learn music, run all sorts of businesses, fall in love, forgive old wrongs, raise children, do magic, and hundreds of other experiences. Stories give me the chance to be and do anything I or anyone else can imagine. And that is significant. Not quite to my 4000 word total for the week, but I think it's a good start. With the kids back at school, I have a few hours each weekday to write (assuming I don't find it crowded out by my day job and errands and appointments). I ended up with two writing days this week, but I had good productivity for both of them, so I'm relatively pleased. I've been thinking a little more about my promotion strategy over the next year. I need to be careful in terms of both time and money but I've got some good ideas. I'm going to talk with Xpresso Book Tours about doing a one day Cover Reveal. 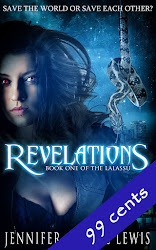 They did a blog tour for me back in February when Revelations was released and that garnered me a lot of attention and some great reviews with the bloggers. I chose not to do a Cover Reveal Tour last time since I was worried I'd lose any buzz I'd generated by the time the book actually came out. I'm also thinking about doing another blog tour with them once Metamorphosis is out but also speak to some other blog tour operators about connecting with a different audience. I need to keep reminding myself to think marathon, not sprint. I have the time to think smart and carefully about what I want to do. I was speaking to someone earlier this week and she commented that she was surprised that I liked (and wrote about) such dark subject matter as post traumatic stress disorder, drug use and recovering from assault since I'm generally a cheerful person and I love happy endings. It took me by surprise and I wasn't able to put together a satisfying answer. (Um, I guess I'm a weird combination multiple personality freak?) It honestly hadn't occurred to me that the two sides were somehow non-compatible. Because to me, they fit together perfectly. The dark side of the human experience fascinates me. People are subjected to experiences which defy even the most pessimistic imagination. The sort of things which make people legitimately question the existence of any kind of benevolent and omnipotent divinity. And yet, people also rise above those experiences. Not all of them, which makes me sad and angry that such things are allowed to happen. But some rise to shine after being put through a life so awful that we all would have understood if they'd only wanted to crawl into a hole for the rest of existence. Like Cindi Broaddus, who was horrifically scarred by a jar of acid thrown off an overpass at random. She fought back to regain her health and keep her family together. Or Randy Pausch, who wrote The Last Lecture after being diagnosed with incurable cancer. He talked about how he saw obstacles as methods for proving who was really determined to get to their goals. I admire people who keep fighting against the odds (regardless of whether or not they succeed) and they give me the strength to keep climbing over the obstacles in my life. That's why I explore people who have been deeply hurt in my writing and show their fight to recover. Life isn't always kind or easy, but it doesn't mean there isn't good in it and those good bits are worth fighting for. Despite a discouraging start to last week when I discovered I had not properly set up my Kindle Countdown sale, it actually turned out pretty good since I was able to finish my editing for Metamorphosis and I'm quite proud of the finished product. My first project will be the sequel to Whispers In the Dark. But I'll also be investigating a new round of promotion for Revelations and Metamorphosis. I'll have to see if I can afford it, but I'm thinking about doing two blog tours, one for each book. I'm also inspired by S.M. McEachern's win in the Reader's Choice Favorites and will look for some contests to enter. One of my critique partners also suggested a challenge for me which I quite like. I've been working on my description, trying to create unique and interesting, but still concise ways of describing people. She suggested that each week I pick a random photo of a celebrity or from a news feed and try to describe them in 10 to 15 words. The idea is to capture something essential and evocative without wasting time on needless details. Since my Friday Quote Cards are done for now, I thought this might be a fun project to share, but I need to look into the legality of reposting photos. I suppose I could sign up for a photo service again, but I'm reluctant to add the expense. I'll keep you all posted. 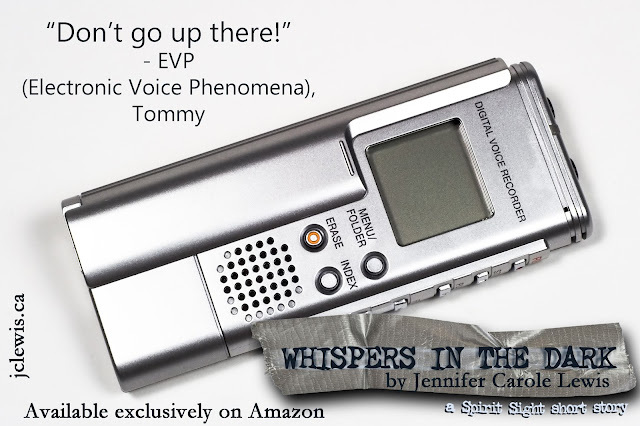 One of the big features in Whispers In the Dark is electronic voice phenomena. This is when voices or other sounds are recorded which were not audible to the people present. Sometimes the words or phrases seem random and other times they seem to respond to the people at the site. It's a common investigative tool for paranormal investigators. EVPs are not without controversy. Humans are very good at picking up patterns, to the point that we will see patterns even when they're not really there. 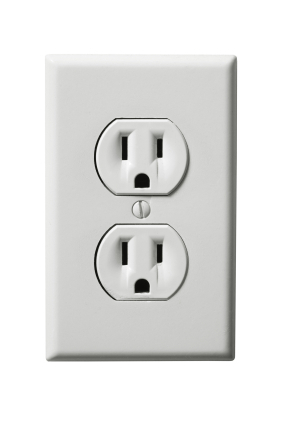 For example, ever seen a face in an electrical socket? Intellectually, we know it's not a face. But any image with two objects above and one below will resolve into a face for most people. We do the same thing with random noises, which is thought to be the origins for mermaids singing at sea: the random noise of the waves resolved into song for bored sailors. Good paranormal investigators recognize this difficulty and try to take it into account when deciding if something is an EVP or simply random background static. The idea of being able to communicate after death is probably one of the most intriguing mysteries to the human mind and one we've probably been searching for since the cave days. Today, most investigators use handheld digital recorders to capture EVPs, although they are vulnerable to radio interference. It's the easiest option for an amateur ghost hunter to try but one of the most difficult ones to verify.